With the exhibition “Hello, Robot. Design between Human and Machine”, the Vitra Design Museum presents a major exhibition that examines the current boom in robotics. It also shows the variety of forms that robotics takes today. At the same time it broadens our awareness of the associated ethical, social, and political issues. 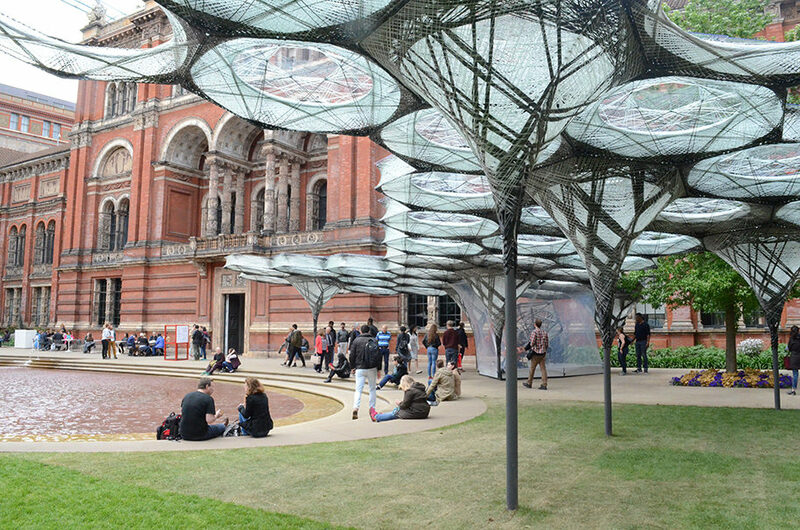 Outside the museum, the “Elytra Filament Pavilion” complements this exhibition. The bionic baldachin is an impressive example of the growing influence of robotics on architecture. First an algorithm and then an industrial robot, realised by the University of Stuttgart, defined and produced its individual modules. After its premiere at the Victoria & Albert Museum in London, it is now on view on the Vitra Campus. 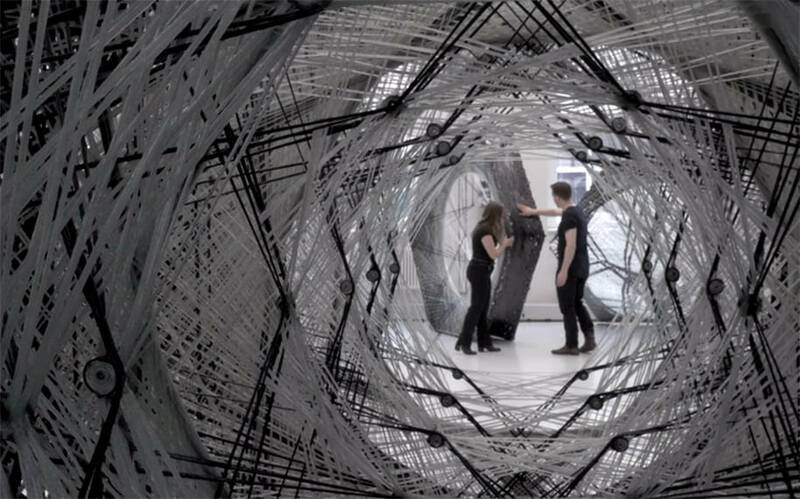 The pavilion is the outcome of four years of ground-breaking research on the integration of architecture, engineering and also biomimicry principles. 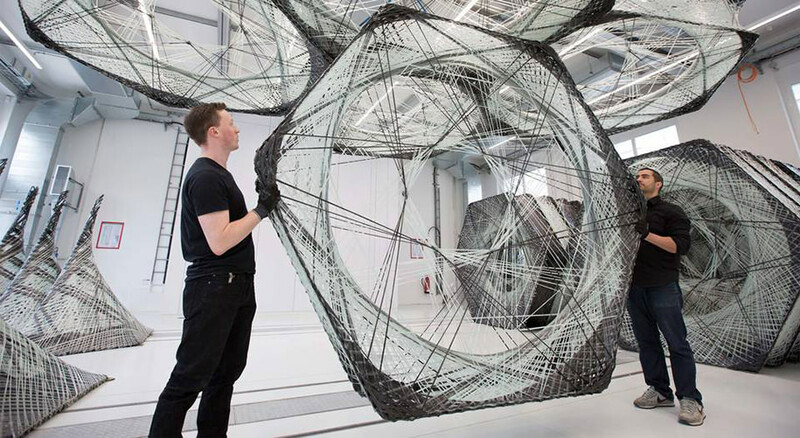 A robot at the University of Stuttgart was responsible for fabricating the components of the “Elytra Filament Pavilion”. Lightweight construction principles found in nature were the inspiration behing the 200m² structure. Particularly, the fibrous structures of the forewing shells of flying beetles known as elytra. Experimental architect Achim Menges together with Moritz Dörstelmann, structural engineer Jan Knippers and climate engineer Thomas Auer have pioneered a unique robotic fabrication technique developed by the University of Stuttgart’s Institute for Computational Design (ICD) and the Institute of Building Structures and Structural Design (ITKE). This technique, developed by the team over several years of research, involves a novel way of winding composite materials. The innovative winding method has been designed to harness carbon fibres and give them strength as woven structural components. A series of these individual cell-like modules has been used to create the pavilion’s distinctive shape, integrating the processes of design and engineering. The “Elytra” project explores the impact of emerging computational and robotic technologies on these disciplines. 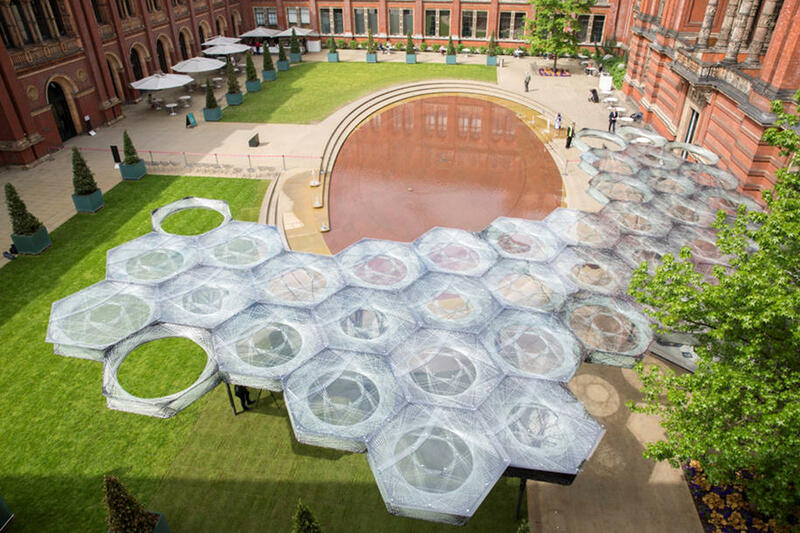 Up to fourty hexagonal component cells crate “Elytra’s” canopy while they weigh, on average, 45kg each and take about three hours to make. Kuka, a computer-programmed robot, created those cells as well as the seven supporting columns. It was a four-month construction process that took place at the ICD’s Computational Construction Laboratory in Stuttgart. 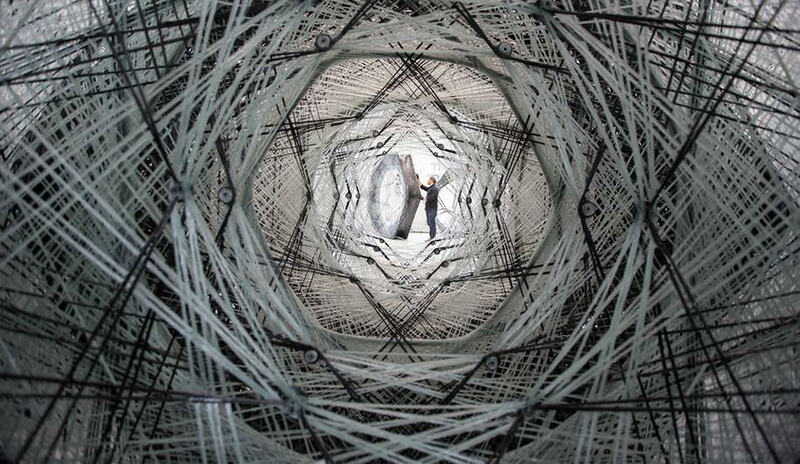 To make each component, the robot wound resin-soaked glass and carbon fibres onto a hexagonal scaffold before hardening. Each cell and column is individual. Its final form of densely-wound fibres is a direct result of the changing stress conditions determined through structural simulation and testing carried out in advance by the ITKE. It weighs less than 9kg per m², which equals 2.5 tonnes for the entire pavilion, therefore enabling an exceptionally lightweight structure. 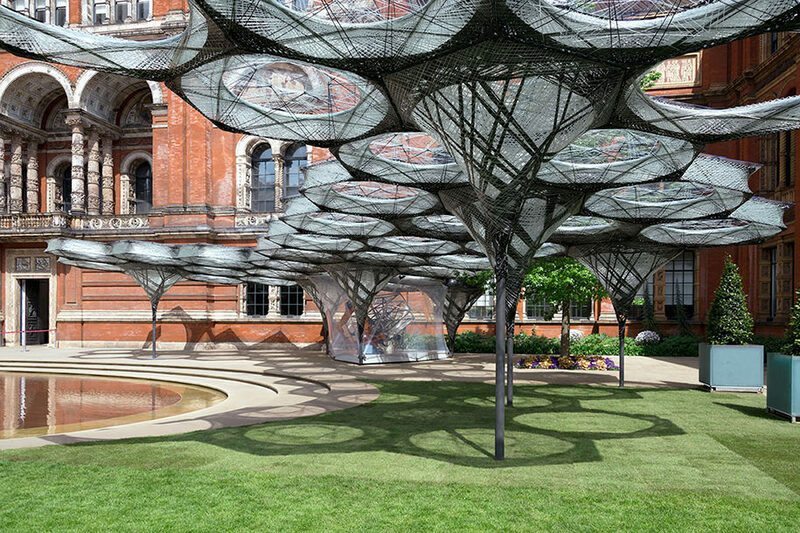 “With Elytra Filament Pavilion we aim to celebrate a truly contemporary and integrative approach to design, engineering as well as production, resulting in a distinctive spatial and aesthetic experience. 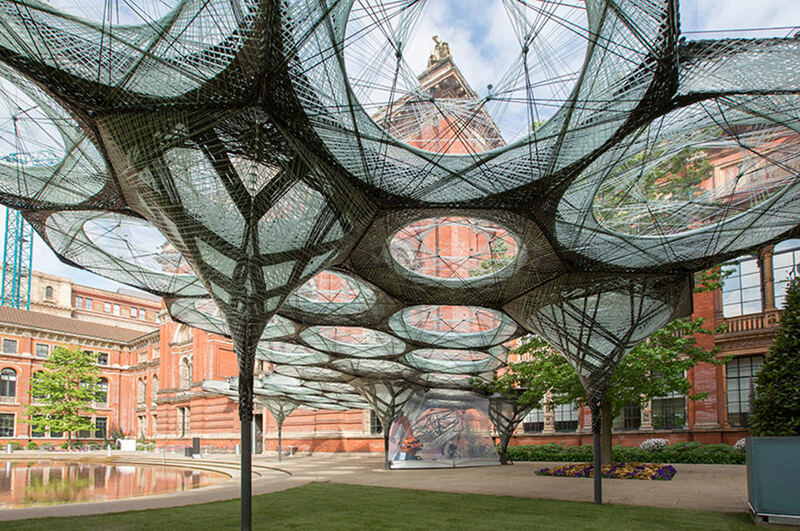 All images are from the “Elytra Filament Pavilion” exhibition at the Victoria & Albert Museum in London. Learn more about the “Hello, Robot. Design between Human and Machine” exhibition at Vitra Design Museum here.